Standard isotopes are concerned with "bulk" isotopic composition of a sample (in our case, carbonates), and expressed as a difference (delta, or δ) between the sample and an international standard (mainly VPDB, or "Vienna Peebee Formation Belemnite" for carbonates). Both standard isotopes (δ18O, δ13C) and clumped isotopes (Δ47) are disciplines in the field of stable isotopes (i.e. isotopes that are stable and do not decay). Both methods also mainly deal with measuring isotopes of carbon (mainly 13C and 12C) and oxygen (mainly 18O, 16O, and to a lesser extent, 17O).The main difference between standard isotopes and clumped isotopes resides in what is measured. The result is expressed in permil, or ‰, and reflects how far the 18O/16O ratio of the sample is from the 18O/16O ratio of the standard. Standard stable isotopes do not, however, tell us anything about how the various isotopes are organised within the lattice of the carbonate crystal. The relatively new field of clumped isotopes goes one step further and is concerned with how the various isotopes of carbon and oxygen are distributed in the lattice of the carbonate crystal. In other words, clumped isotopes are concerned with distinguishing "isotopologues", i.e. molecules of similar chemical composition but different isotopic composition. 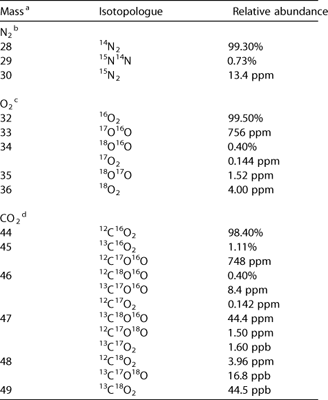 The table on the left, from Eiler (2007), illustrates the various isotopologues of N2, O2 and CO2. When carbonates are reacted with othophosphoric acid, they produce a CO2 gas in isotopic equilibrium (but with a constant offset linked to acid temperature) with the original carbonate. The field of clumped isotopes is concerned with measuring an isotopologue of CO2 gas with a mass of 47, i.e. where the two "heavy" rare isotopes (13C and 18O) are substituted in the CO2 molecule. This is representative of the amount of "clumping" of the heavy isotopes in the crystal lattice of the carbonate measure. 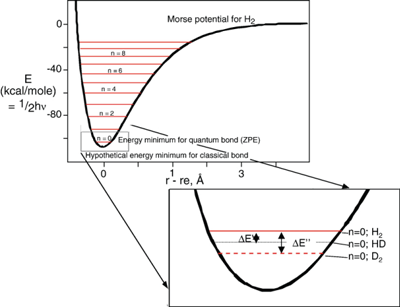 Thermodynamics dictate that the clumping of heavy isotopes is favorable for the stability of a given molecule, i.e. the zero energy point of a molecule with heavy isotopes substituted in the molecule is lower than for a standard molecule (see Figure on the right, example with hydrogene, HD, and deuterium, Eiler 2007). The significance of measuring Δ47 resides in the fact that the amount of clumping at a known temperature can be determined thanks to the laws of thermodynamics alluded to in the previous section. The ordering of isotopes within a crystal structure (or preferential clumping of heavy isotopes at low temperature) will be counter-balanced by the effects of entropy: this implies that as temperature increases, clumping must decrease and eventually reach a purely stochastic distribution at high temperature (i.e. > 1000˚C). Gosh et al. 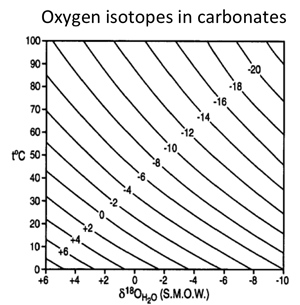 (2006) were first to demonstrate that this theoretical assumption holds through for actual carbonates by calibrating Δ47 for a range of different carbonates ranging from controlled precipitation experiments to various biological material (see figure 2, left, from Eiler et al., 2007). Initial results suggested that a single calibration line could be derived for all carbonate phases: in other words, clumped isotopes were thought free of any "vital effects" or mineral-specific fractionation effects that plague standard δ18O measurements. Guo et al. 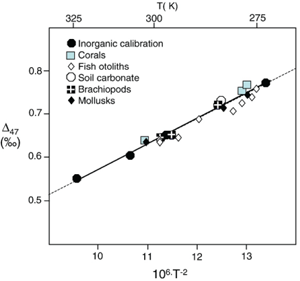 (2009) subsequently provided a theoretical calibration for a number of different mineralogies, taking into account acid fractionation factors for any given temperatures.The initial assumption of a relatively "simple" calibration line still holds true for most of the existing carbonate species, making clumped isotopes one of the most promising paleothermometer for paleoclimate and diagenesis (see e.g., Eagle et al., 2011, Tripati et al., 2011). However, recent work has shown that disequilibrium exists for some specific carbonate species. For instance, speleothemes (cave deposits) display disequilibrium, i.e. their Δ47 is not reflecting cave temperatures (Affek et al., 2008, Däron et al., 2011). Furthermore, some species of deep-sea corals and mollusks have shown disequilibrium interpreted as vital effects (Thiagarajan et al., 2011, Zaarur et al., 2011). Clearly, clumped isotope research has entered an exciting new era where our understanding of the fundamental processes leading to clumping of heavy isotopes in carbonates will increase through new and improved calibration and fundamental work. Traditional stable isotopes (δ18O) in carbonates have been used for decades as a paleothermometer, and/or to fingerprint geological processes. This is because δ18O in carbonates is a function of both temperature of precipitation and fluid composition (see figure on the right, where isobaric lines of equal δ18O in carbonate exist for a range of precipitation temperature and fluid composition). This dual dependency of temperature and fluid composition has plagued δ18O for decades, as to estimate one of the two parameters one needs to know the other (which is almost never the case for geological records, or very rarely the case). Clumped isotope is a gas source stable isotope application, meaning that δ18O and δ13C are measured simultaneously to Δ47 in the same sample. Because Δ47 is independent of fluid δ18O compositon and thus only reflects temperature, both the δ18O composition of the fluid can be reconstructed using clumped isotope. This is a major breakthrough as it allows the estimate of fluid oxygen isotope composition even in the absence of fluid inclusions or other independent temperature estimates. This in turns allows for unambiguous fingerprinting of processes such as diagenetic transformation and paleoenvironmental changes. Some examples of published applications making use of the ability to reconstruct fluid δ18O include reconstructing changes in strength of the Asian monsoon (Suarez, 2011), reconstructing the history of cementation (Dennis and Schrag, 2010, Huntington, 2011), and reconstruction of paleo-elevation (Ghosh et al., 2006b).